Here at Buckingham Garden Centre we have a well established and popular Poultry Centre where you can find everything you need for your chickens whether you are new to poultry keeping or an experienced enthusiast. Our friendly and highly experienced team are on hand to give you all the help and advice needed to get started keeping your own chickens. We are also happy to chat to anyone who is just curious about the art of keeping poultry and may just be thinking about whether or not chickens are for them. 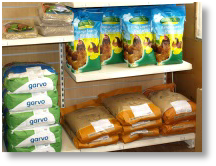 We offer a range of feeds including Garvo, a premium range feed and chicken treats in various sized bags. 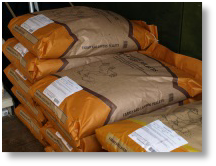 We also offer Marriage's poultry feed, including an organic range, and supplements such as mixed corn to keep your hens healthy and happy. 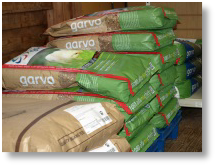 We also stock other varieties of feeds and supplements which you can see in store. 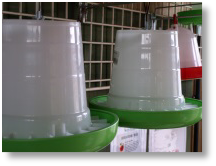 We also offer everything required for caring for your chickens from feed and feeders to a wide selection of vitamin and mineral supplements, and lotions and potions for treating minor ailments and injuries. 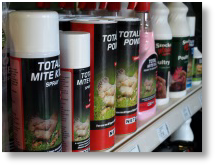 We also have a comprehensive range of red mite treatments for the hen house and for treating the chickens themselves. 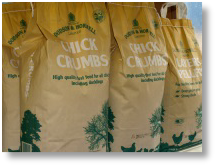 We sell a variety of bedding options which include barley straw, meadow hay and wood shavings which are all perfectly suitable for poultry. The team looks forward to your visit and is ready and waiting to answer all your poultry questions! However, if you are unsure about keeping chickens, we have a useful 'frequently asked questions' sheet online which covers the most common questions our customers ask us. You can download a copy in PDF format.